I scream, you scream, sunscreen! It’s easy to forgo sunscreen when going outdoors - “I’m wearing a longsleeve and long pants!” is something I regularly hear and also have said plenty of times myself. But a sun-burned neck and shoulders have taught me better and so nowadays I always pack some mawaii SunCare when I head outdoors. 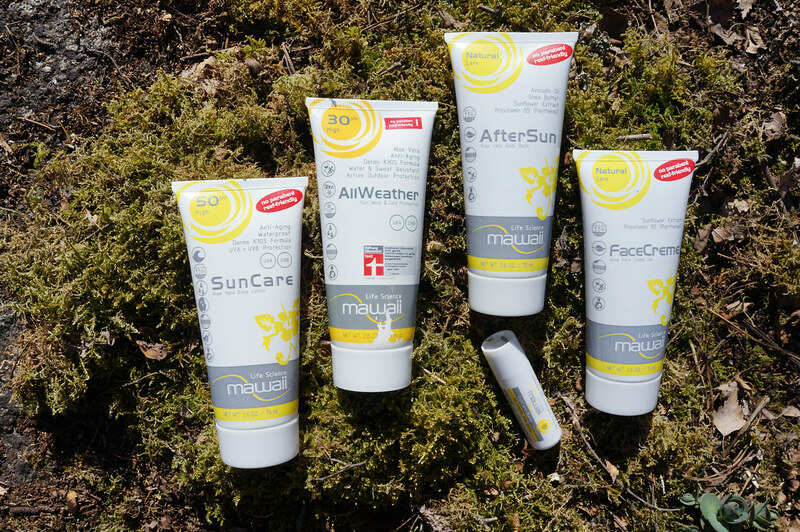 mawaii is a young German startup who set out to develop a sunscreen product that is made for the needs of us outdoor folks. It is waterproof, sweat-resistant, doesn’t stick or put a greasy film on your skin and at the same time the sunscreen soaks in quickly and provides the skin with aloe vera, vitamins, protects it from UV and several other rays and a whole lot more of good stuff. The guys at mawaii have a long FAQ which will answer any questions you may have, but I’m here to share my experiences with their products. During winter (at the Abisko Ice Climbing Festival) and in the Lake District I used the AllWeather Creme, which combines a SPF 30 with a cold & wind protector (and a bunch of other fine things, like keeping the skin moisturized). Usually in winter my cheeks will start to crackle and being a tough guy I just wear the cracked, dry skin until the snow melts and the dry skin falls off. Well, almost. Then, one crappy winter morning, I decided to find the soft guy in me who keeps his cheeks looking healthy - also when he returns home after a day ice climbing at -20°C. For that reason I put on the AllWeather Creme in the mornings before heading out (so it can settle in!) and re-applied it in the early afternoon during lunch. The results speak for themselves: Women and men would gather around me while I stood with a whisky at the fire, telling stories of the latest adventure in the blistering cold, while my cheeks only had a healthy red hue to them. I was so impressed with the stuff that I also put it on my son’s cheeks when we went playing outside in winter, and he too came home with healthy cheeks that weren’t dry & cracked. Then in the Lake District I was rather happy to have the AllWeather Creme along, as the weather was indeed all-kinds-of-weather. Sunny. Rainy. Windy. Cold. Hot. While I can’t say I felt less wind or warmer thanks to it, the elements had no chance in drying out my skin or cracking it up. This results in me still looking like a strapping young lad even as I’m getting older each day. And while I turn older each day, winter (which winter?) turned to spring, which really was just that one week were everything goes green in this country and then it’s summer (Finns likely will add in that then it’s soon Midsummer and then it’s winter again). As I made that smart move to Vaasa two years ago - it being the sunniest city of Finland - this means gorgeous sunny days to go bouldering, cycling, paddling, climbing, hiking, working in the garden, eating ice cream on the porch and just sitting outside and watching the birds sing. I’m not the easily-to-be-burned-kind-of-skin-type, which I attribute to wearing longsleeves, long pants and windjackets (this is a coastal city, after all). But every now and then it gets so warm that a T-shirt is the only smart option to wear. But how not to burn them arms? And that neck? And the nose? And the ears? I thought that maybe mawaii SunCare - which comes in s SPF 10, SPF 30 and SPF 50 variety - could do the trick. My unscientifically testing at the crag, cycling and hiking has shown that it works to 100% certainty and I come home un-burned with a still healthy looking skin and a tiny bit more tan (I’m also a not-easily-getting-tanned-kind-of-person). Applying the what works for dad can’t be bad for the son principle the little one also is treated to daily doses of mawaii sunscreen (the 75 ml versions are pretty efficient) with the same results as me. As for the other products they gave me for testing: I have used the LipCare Balm to good effect in winter (and will take it along next week to Chamonix) but only when I felt I really need it. Lip balms seem to make one addicted to it and hence I use it sparingly. In winter use it worked well, keeping my lips soft and not dry & brittle as they like to become when exposed to cold weather. The After Sun and Face Creme haven’t see any use yet, but hey - it’s sunny outside, so I might just put some on and go outside! You might think we outdoor types need to look sunburned and rough, and you might be right. But lemme tell ya: Wearing a backpack on sun-burned shoulders is no fun. NO FUN AT ALL. It practically takes all the fun out of backpacking. Don’t touch them burned shoulders. Don’t even look at them. I learned from past mistakes. I moved on to apply sunscreen or AllWeather Creme to exposed skin so that I can keep on having fun in the sun. Repackaging the needed amount into small bottles is recommended for backpackers who pay attention to weight (unless you’re thru-hiking the PCT, then I reckon you’ll need one 75 ml tube or more). Lather up before you leave the tarp or bivy and enjoy a fine day at the fresh air under the sun, knowing you will not get burned or worse. 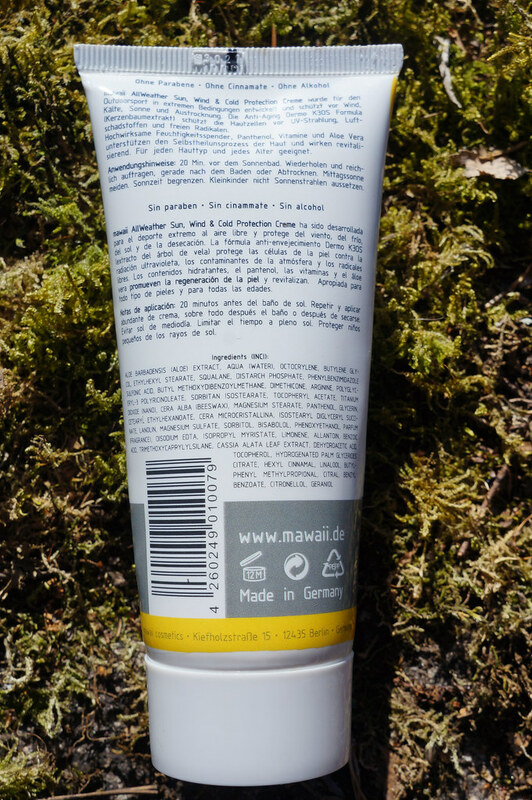 Get your sun screen before you get a sun burn directly at mawaii or from Bergzeit.co.uk. Apply to skin and go outdoors!